The proposed system, the Investment Court System, would replace the controversial investor-to-state dispute settlement (ISDS) mechanism, which allows corporations to bypass domestic courts to sue governments over policies that could affect their profits. 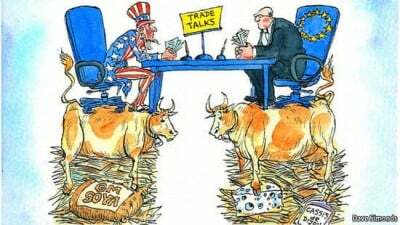 Fears that U.S. multinationals could use private arbitration rules in the proposed trade pact to challenge European food and environmental laws have overshadowed a transatlantic project meant to ease business and compete with China’s economic might. “We want to establish a new system built around the elements that make citizens trust domestic or international courts,” her statement continues. UK-based Global Justice Now, however, says the proposal offers mere cosmetic changes to the ISDS mechanism, to which the European public has voiced overwhelming opposition. “The real issue at hand here is that of corporate power,” Dearden added. “The European Commission’s proposal for an ‘International Court System’ is tarred with the same old corporate friendly brush,” stated Natacha Cingotti, trade campaigner at Friends of the Earth Europe.